With Lighthouse, just ask for what you're looking for and the video comes up, or create "Pings" for real-time alerts, all with natural language! So now you’re wondering, “Wait, so how is any of this possible? You just ask it questions? With basically no setup?” Yes. It’s incredibly powerful, but incredibly simple to use. Lighthouse can do all of this (and more) because it has a 3D “time of flight” sensor paired with a full 1080p video camera, both tied into a computer vision system that provides much more intelligence than its competition. Lighthouse can accurately identify people (adults and children), pets (cats and dogs), but it will ignore objects, shadows and lighting changes that can trip up other cameras. The data sent up to the Lighthouse secure cloud from the camera is quickly crunched by powerful systems that enable you to search the recorded footage for people, pets and other activity through natural language search. Whether it’s setting up a “Ping” or asking Lighthouse what the pets were up to last night, you interact with it naturally. The ability to uselessly scan through hours of video footage to find what you’re looking for doesn’t even exist with Lighthouse. A “Ping” will give you a recap of what happened, and asking to see something specific will take you right to that activity. Remember the example above “When did you last see John?” Yes, that’s right, Lighthouse has facial recognition built-in, too. Combine that with its computer vision, 3D sensing, geolocation (via app) and AI and you get an incredibly powerful, but thoughtfully-designed home security camera. There’s no right or wrong way to use the Lighthouse camera, and if you follow its helpful suggestions in the app, you’ll find that its natural language search is more powerful than it seems on the surface. Pings like “Tell me if you don’t see the dog walker by noon on weekdays” work, too. Those Pings won’t give you a video clip to watch, but will still provide you a contextual alert. You can invite guests and family members to Lighthouse via the app, and assign them the right level of permissions so that they can interact with your home without setting off a false “unidentified person” alert. The special 3D "time of flight" sensor on the Lighthouse camera. Speaking of guests and family members, some people are concerned about privacy when placing a security camera into their home. Lighthouse has thought about this, and has a great solution. Based on the geolocation, the camera can automatically turn off when members of your family arrive home. It’s an optional feature in the Lighthouse app and be setup to your liking. And the LED on the front of the camera can always indicate to you whether the camera is truly on or off. You can also manually turn the camera on and off from the Home tab, and control the recording of audio through the privacy settings of the app. Of course, Lighthouse has all the other things that a security camera should have, like two-way audio, outstanding night vision, a 115 degree field-of-view, 2.4 and 5 GHz Wi-Fi, and even a powerful siren. Lighthouse sits on a removable base and has a tilt mechanism at the bottom of the camera so you can adjust it to get the right view. There’s a wall-mount adapter available, or you can create your own mounting system since Lighthouse has standard 1/4” tripod threads. See all tech specs here. The Lighthouse camera stands tall, just like a traditional lighthouse. I had previously heard about Lighthouse, and seen reviews and ads for the camera. But I wasn’t sure if they could really pull off everything that was promised. I’ve had poor experiences with other cameras, and friends tell me the experiences that they have had with “advanced” cameras that still aren’t so great. But I was really quite surprised when I started using the Lighthouse camera and that it immediately started recognizing (and highlighting) me as an actual person in the video clips. As I expanded my testing to include my friends and even a “borrowed pet”, Lighthouse continued to perform very well. Sometimes there would be issues where it would think part of me or another friend was a pet or vice-versa, but AI isn’t perfect and you have to give it data so it can improve over time. Lighthouse includes a button below each video cilp where you can indicate to them that something was mis-recognized, and then they’ll take a look at it and improve the algorithms. For me personally, one big difference with Lighthouse compared with previous cameras I’ve used was not receiving “false alerts” when I am not home. Lighting changes from sun and clouds along with my nighttime randomized lighting sequences that mimic normal home activitiy, tend to cause many alerts from other cameras. Eventually, I would ignore the alerts because they would come in so frequently. With Lighthouse, there have been no alerts whatsoever. I almost thought I might receive just one, and it would keep adjusting itself. Nope. No false alerts whatsoever. Zero. That’s how it should be! 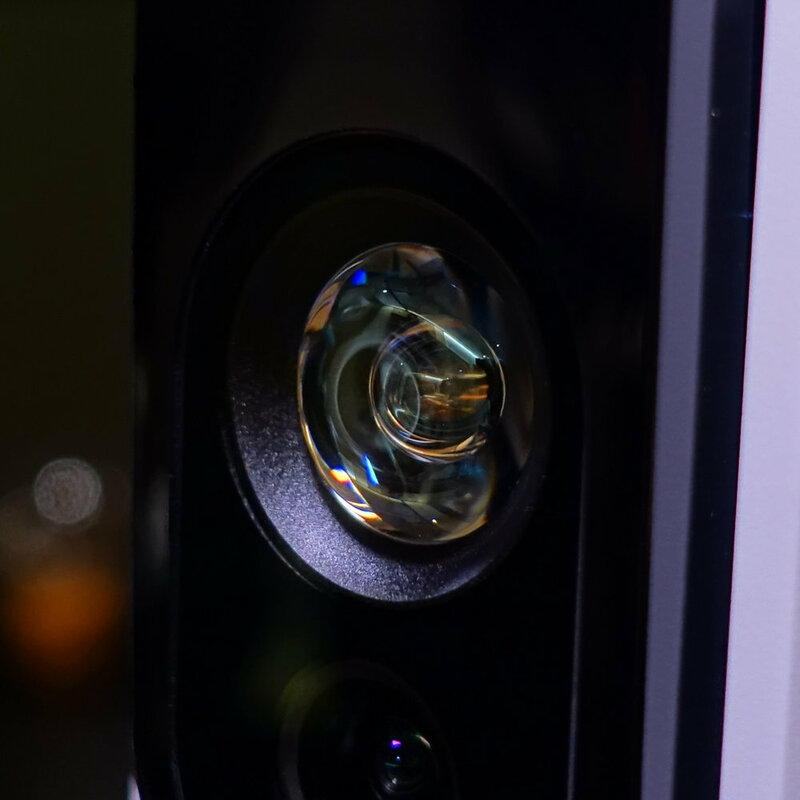 While the Lighthouse camera might not automatically tilt and spin around, or have an insanely-wide camera angle (the RGB field of view is on par with other cameras)…its sensor and AI certainly perform much better than the competition. And isn’t that what you actually want from a security camera? Yes. FTC Disclosure: This review was sponsored by Lighthouse. A Lighthouse AI camera was provided to Smarter Home Life.